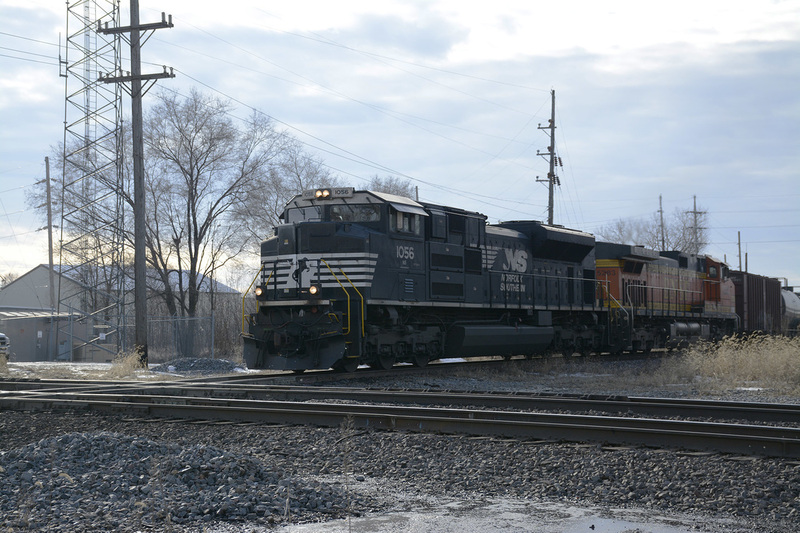 Norfolk Southern oil train passes an old NYC signal at Kankakee Junction, "Kent". 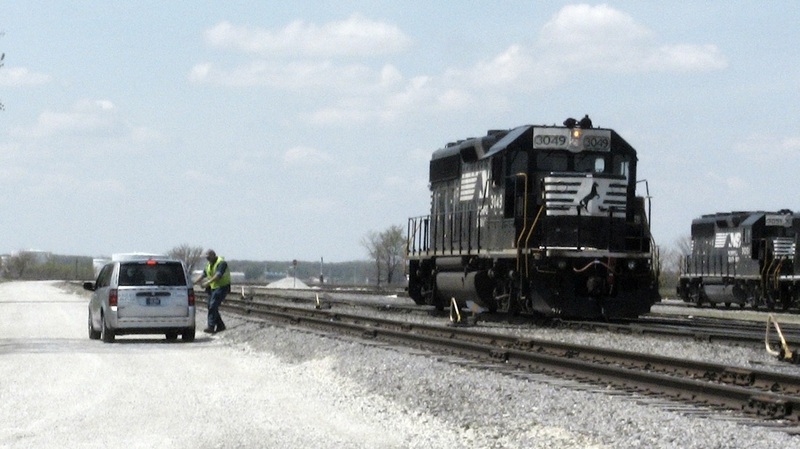 ​The New York Central railroad had a large presence in Kankakee, IL beyond the Big Four line. In fact, this line is the most heavily used remaining portion of the old NYC. The Indiana, Illinois, and Iowa railroad was created in the mid-to-late 1800s. It ran from Streator, IL into central Indiana, never fully reaching Iowa. The Indiana, Illinois, and Iowa was merged with the Indiana Harbor Railroad in 1906 to create the Chicago, Indiana, and Southern. The CI&S became a subsidiary owned by the New York Central railroad due to its stocks being owned by New York Central System members the Lake Shore and Michigan Southern Rwy. And the Michigan Central Railroad. The railroad created became known as the Kankakee Belt Line. ​The Kankakee name is moreover in reference to the Kankakee River Valley which the railroad parades through and over. 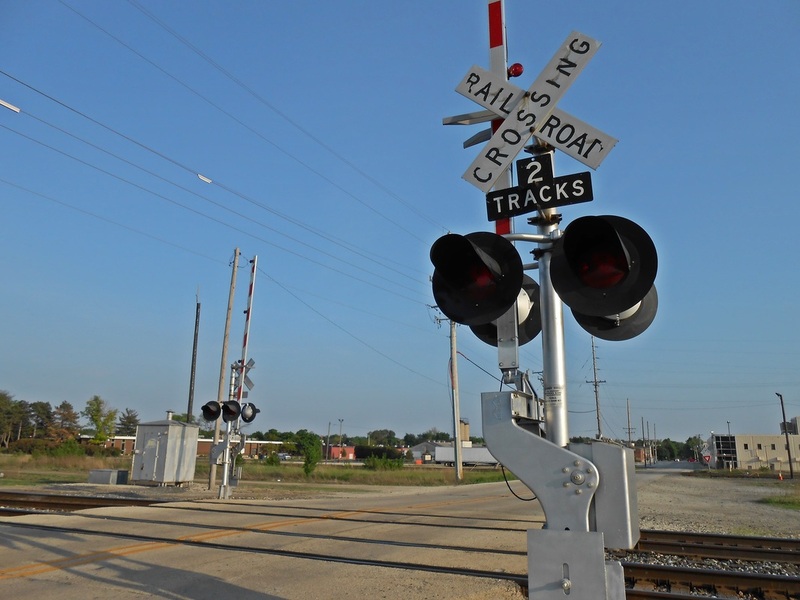 In the Kankakee, IL area the railroad follows east and west north of the Big Four Line. The Big Four Line crossed the Illinois Central only but a few blocks south of where the CI&S did so. The two railroads, especially beyond NYC ownership, became much interconnected due to the common ground held between them. Nevertheless, although the Big Four had an established roundhouse along Greenwood Avenue, the CI&S kept theirs right on the northwestern corner of the diamond with the Illinois Central railroad. 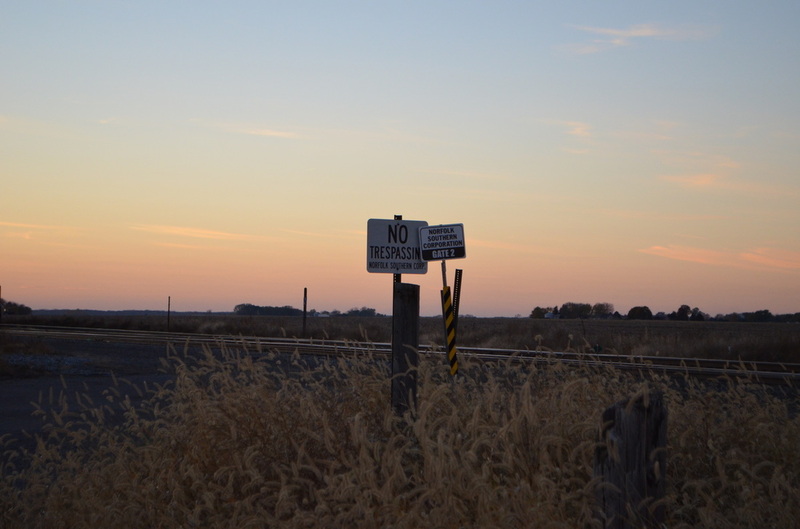 The area is now torn down and leveled – now used for a construction company’s lot for equipment. The roundhouse was accessed from the western side of the diamond with tracks that paralleled the surviving interchange track and fed into the line. It all narrowed down before the Kankakee River Bridge, the surviving version of which was built by the NYC well after acquiring the CI&S and Big Four. 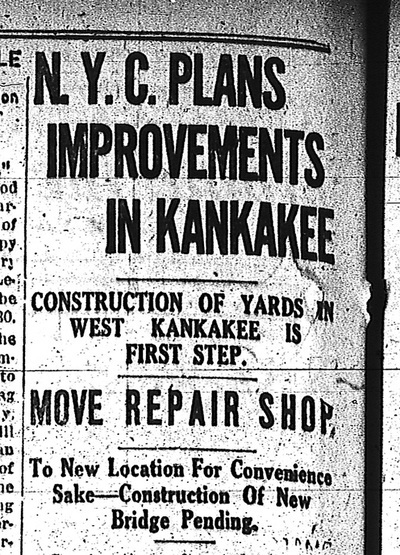 ​Although the Kankakee Belt seems to be a well-established railroad built off the bat in such shape, the NYC has made several modifications and critical changes to the route that forever shaped its fate in play in today’s economy. 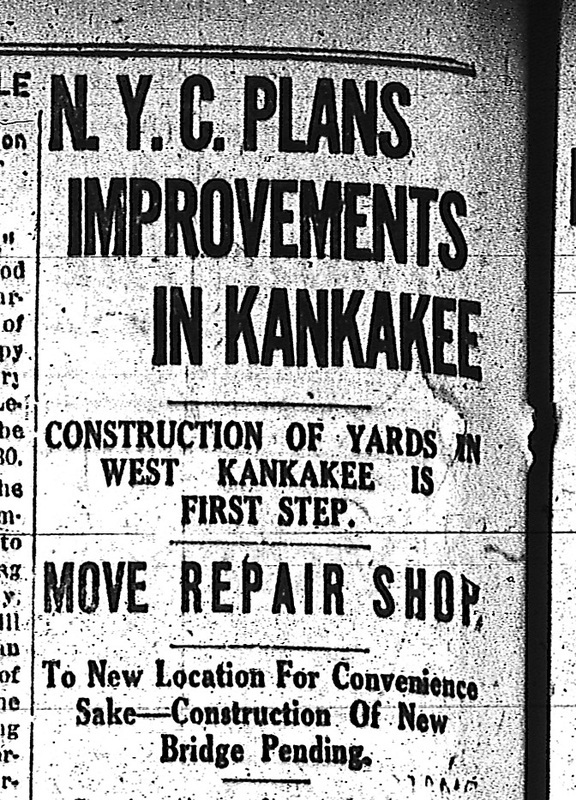 The construction of the Kankakee Yard in western Kankakee, IL was planned by, paid for, and done under the New York Central System. Although the yard existed beforehand, the NYC created the yard into its modern form. To this date the yard remains a vital asset to the line. Having a few tracks removed over time, the yard is now seeing the re-installation and of more tracks and extension/upgrades. In fact, as history proves, Conrail would end up changing the landscape of many of New York Central’s lands as fate would have it. NS Local arriving into the yard at Main Ave.
​That said, this is the only line through Kankakee that did not have an extravagant depot built? This may not always have been the case, but in part this is due to the competition already present. With the ICRR already offering lavish trains to the gulf with promising connections to the coasts, and the Big Four handling traffic from Chicago to central Indiana – there was never a huge investment into passenger service on this rail line. Rightfully so, the rail line services several well-known industries in the area. One of the most interesting set ups is present at Valspar Paints in Kankakee. 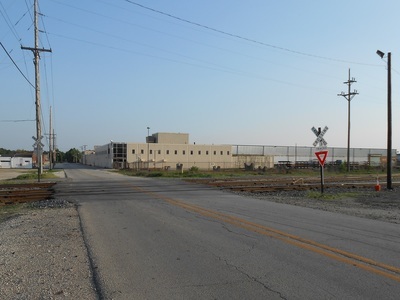 This factory makes finishing products for the brand and features a spur that comes off of the NS line over Harrison Avenue that curve through the outdoor yard of the factory past machines and equipment before crossing on another gated exit over Fair Street and continuing to its destination. This spur line, in fact, does not directly service Valspar, but is for Armstrong along Brookmont Blvd. just north of Valspar. The factory with Armstrong makes tile flooring and so forth. The spur splits into two at a Y shaped switch. One section used to cross a few creeks before continuing across Schuyler Ave. into the IC yard at Kankakee north of Brookmont Blvd. That particular segment is now only a side spur for holding hoppers waiting to be spotted or already used. The spur is only used by the NS local that spots fresh cars at the factory and removes emptied hoppers, and by the factory’s very own Trackmobile which will spot cars additionally as required during production. The spur overall has three crossings, and originally four. The crossing at Schuyler Ave. is completely removed. Only tracks on either side of the road are tell-tale signs. The bridges are still mostly together. The design is similar to Conrail installed bridges. Rumor has it South Street, a very short lived street that parallels part of the abandoned spur, was once named “Conrail Railroad Street”. Another huge industrial section of the belt line in Kankakee not to be overlooked is near the Interstate 57 overpass. There is a small yard in which a local will work that is adjacent to an old dog food factory once serviced by the railroad extensively. Now only a few customers including DOW chemical and so forth in the industrial park are serviced by the yard and its spurs. One spur, which crosses Eastgate Parkway near Grinell Road, goes to a metal working facility that takes gondolas of scrap metals. This job works on a very frequent schedule. 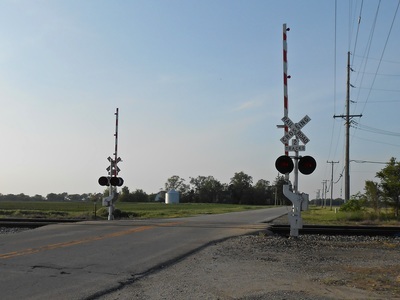 The point on the line where the line crosses the Illinois Central is known as “Kent” as indicated by a sign posted by Conrail. It is unknown if this naming convention carried over from a previous carrier, but Conrail seems to have coined the current operating system NS uses. The line is currently undergoing signal upgrades due to PTC demands. Naturally, this line has many grade crossings as it passes through suburban Kankakee. These include Grinell Rd., Hobbie Ave., Greenwood Ave, Harrison Ave, N. Indiana Ave., Fair St., Brookmont Blvd., Schuyler Ave., Entrance Ave., Fifth Ave., and Main Ave. - there may be one or two country crossings east of Kankakee I am missing, but beyond that, that is the majority. I am in the process of collecting pictures of all these crossings. Main Ave. has two crossings, one crossbuck and one signalized for the two track sets into the yard. The bridge currently is a steel deck girder type with concrete and stone piers and abutments. It spans over US45/52 (Kennedy Ave.) and the Kankakee River past Bird Park going past the Riverside Hospital in Kankakee. I am also in the process of acquiring images of this bridge. 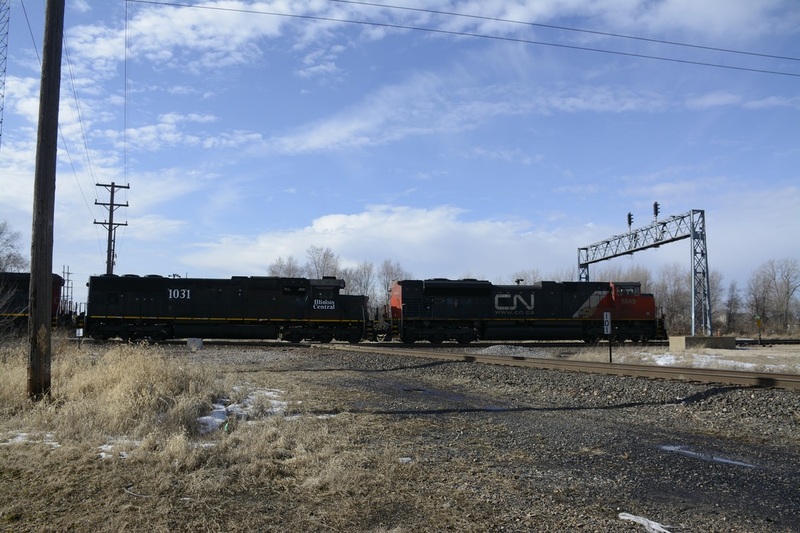 Conrail has left a good mark on the signals currently used, as well as NYC. The two home signals at the K3 junction are GRS Searchlight signals of NYC spec with a small target to show. 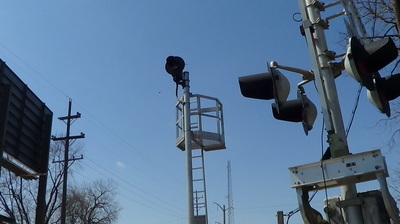 The approach signals are G-type signals made to Conrail spec with "A" plates indicating their function. They are only able to display an Approach or Clear aspect. 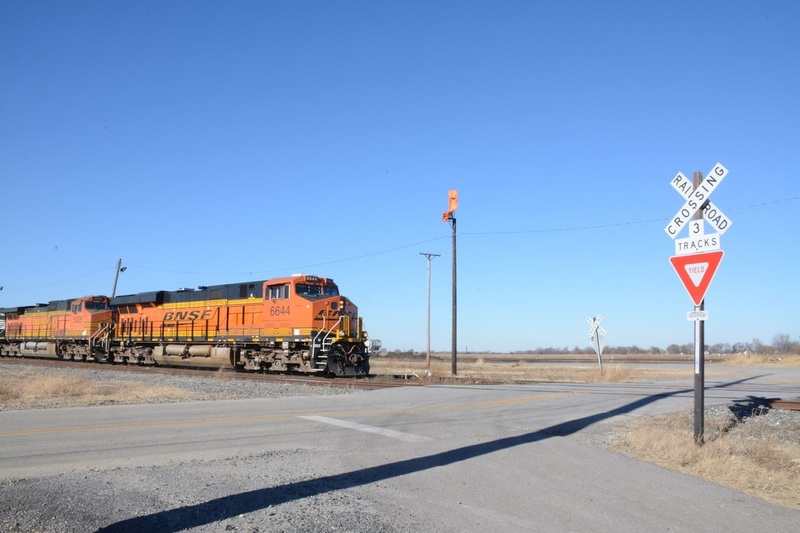 One is located at "K2" east of Kankakee just short of Grinell Road crossing. 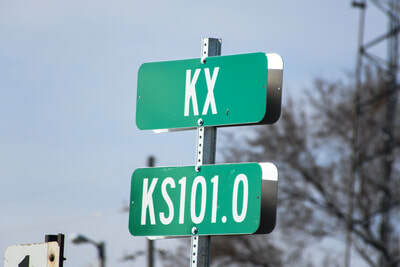 The other is at at "K3", or the yard... just east of Main Ave. 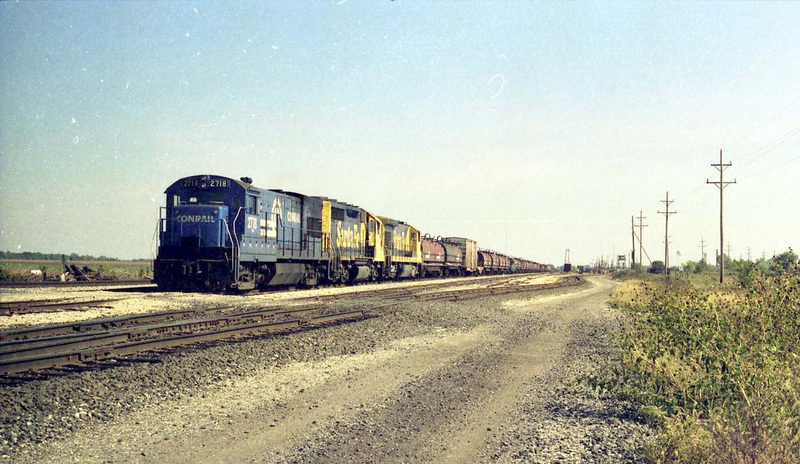 The Kankakee yard was improved and put together by the New York Central. An article included from the Kankakee Daily Republican indicates this was done during the NYC management days rather than under the 3I or CI&S alone. The article goes onto mention the bridge being redone. This was also carried out by the NYC and I am currently in the process of acquiring a copy of that image showing the current bridge being built. The yard is nothing huge but has a large train capacity. Trains often stop to have cars taken on or tacked on or just hold while crews change and the time goes by. Trains such as 31K and 10R all stop here or have deep origins from the yard. 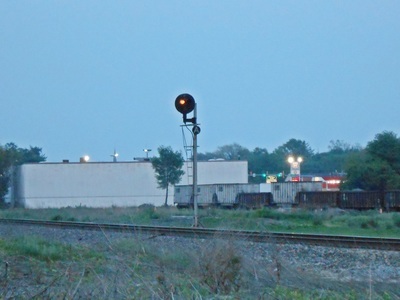 A local switcher will work cars and locals originate from this yard to industries out to Streator and into Schneider, Indiana. As mentioned before, the Chillicothe Subdivision and the Kankakee Line have a good history for detouring traffic and handling traffic around Chicago. 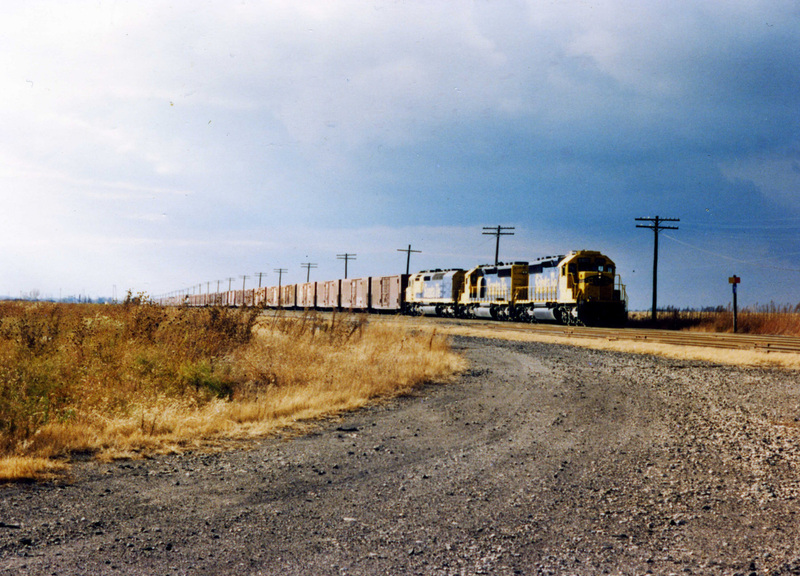 This is a long term relationship shown by earlier images provided by Robert Burns of the yard in Kankakee during Conrail ownership. 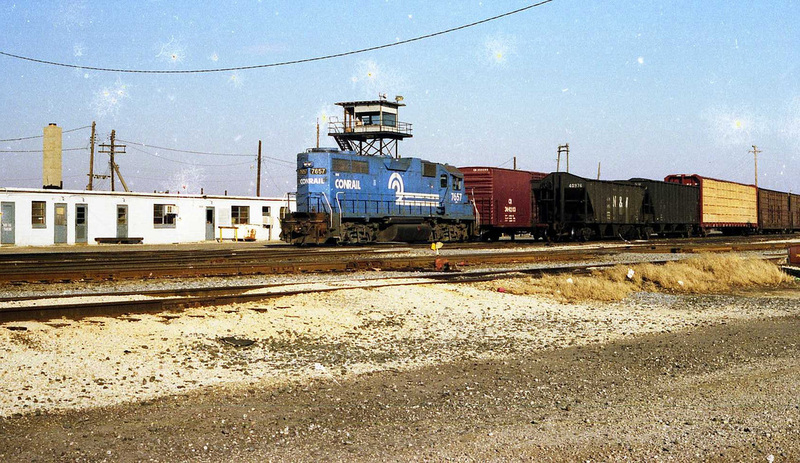 Conrail headed train with ATSF power on the west side of the yard. Conrail GP38-2 7657 is with a cut of cars next to the yard office. Besides the lack of a paved lot and paved walking path, the buildings have not changed too much over the years. By Robert Burns. The Kankakee Junction with IC - "KENT"
The Junction back when the IC still had three tracks over it. The Conrail train here is a steel train that no longer operates. R. Burns Image. The junction at the Illinois Central with the Kankakee Line is and has been controlled by the IC and now CN railroads. Originally the diamond was 4 tracks wide, shortened to three, and finally it is two wide today. The Kankakee Line has always been a single track across. On the CN/IC is it known as "KX" and on the Kankakee Line, it is known as "KENT". The junction has been very well used and it has an interchange track on the western side that goes into the CN/IC yard. The junction is very close to where the Big Four junction was just south of the Kankakee Line junction. This is the only remaining junction in Kankakee with a diamond. A Norfolk Southern oil train is about to pound the diamonds at Kankakee. A CN/IC manifest crosses the Kankakee Line at the junction. 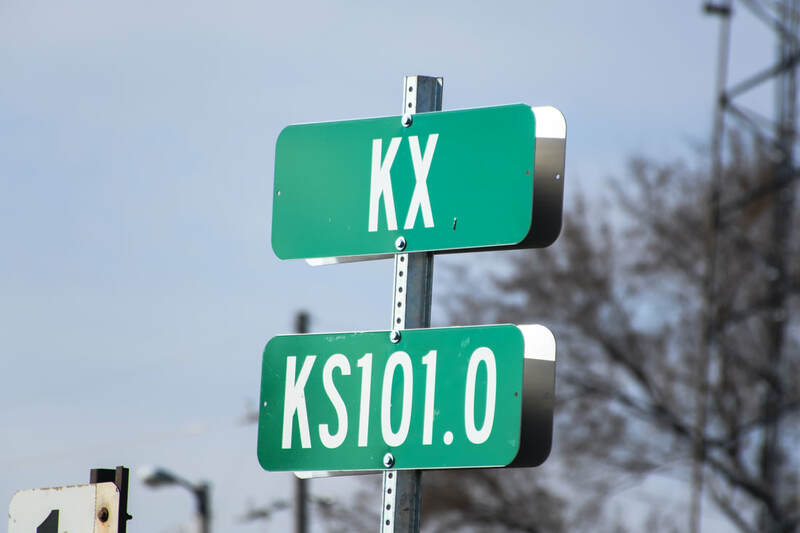 Note the junction is at Mile Post 101.